I’m excited to share with you all a new resource RSI put together for court ADR programs. Curiosity and self-reflection tend to be self-selecting criterion for successful mediators, so it’s not surprising that mediators often crave feedback about their performance and how they can improve. Fortunately for courts, that’s a great instinct, and one that should be nurtured through the use of a structured process whenever possible. To these ends, we at RSI put together some tools for program administrators to utilize in developing a peer-based review support system. 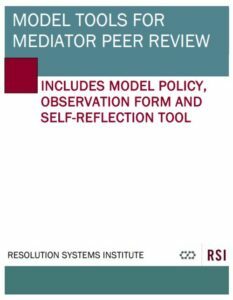 Peer review is a great way for mediators to develop new skills: as long as proper oversight exists to make sure bad habits aren’t proliferating, mediators can learn a tremendous amount from one another. Implementing a peer review system also has the added benefit of galvanizing a community of mediators. Perhaps most beneficially, peer review can function as quality assurance to ensure that the services people receive aren’t a form of second-class justice. Programs that serve self-represented, indigent and other underserved populations may be particularly keen to ensure quality services. I hope you will find this resource a boon to your program. Please share any feedback you may have, as well as any steps your program has taken to support mediator development. This entry was posted on Friday, July 20th, 2018 at 9:06 am	and is filed under Program Management. You can follow any responses to this entry through the RSS 2.0 feed. You can leave a response, or trackback from your own site. Very straight forward and would seem very useful. I am always fearful, however, that the “guidance” becomes rigid and “the only way” to do things. But there is risk in everything, and this work seems to be very useful… Will be nice to see what users [mediators, observers, administrators] think of it in the field.